Blake Roberts competes in the shot put for Miami Trace at Wilmington High School March 23, 2019. 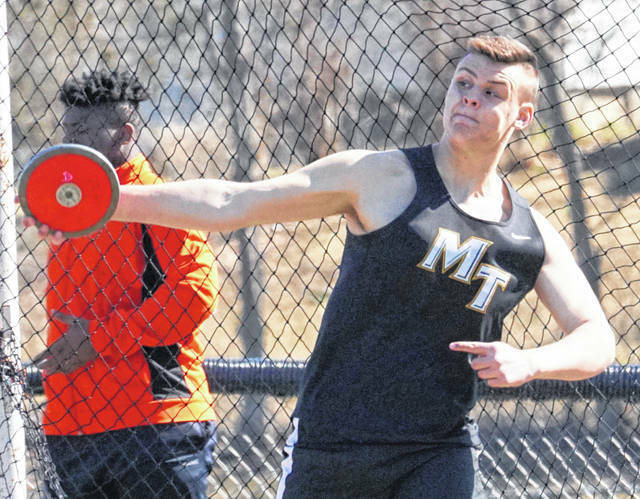 The Miami Trace track team opened the 2019 season with a meet at Wilmington High School on March 23. The format was a field event relay. In the boys’ meet, Wilmington won with 24 points, followed by Xenia with 22 points. Miami Trace was third with 10 points and Bellbrook scored four points. In the girls’ meet, Wilmington won with 28 points. Miami Trace finished second with 16 points, followed by Xenia with 14 and Bellbrook with two. Miami Trace won one event and that was the girls’ long jump, where Macy Creamer and Magarah Bloom combined for a distance of 28’ 7 1/2”. Tori Morrison and Bloom combined in the high jump for second place with a total height of 8’ 6”.